← We’re Celebrating Take Your Child to the Library Day! So you have new media in your storytimes and other library programming, but what about incorporating into your children’s spaces? 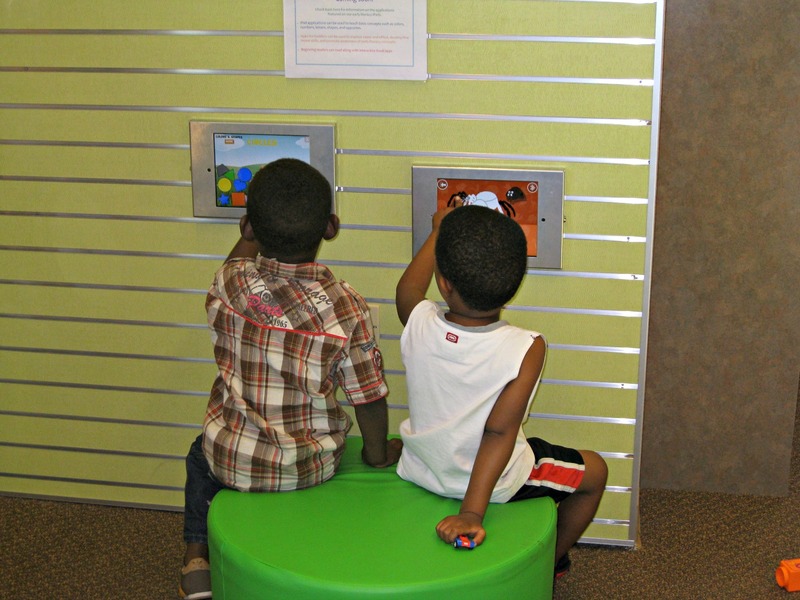 Since their first pilot in October 2012, Sacramento Public Library has installed early literacy iPads into the Kids’ Spaces at four library branches and in a pop-up library project cosponsored by the library and News10. With each pilot program we’ve learned new tips and tricks for getting the most out of tablet technology in our libraries. Why put tablets into our libraries at all? Digital literacy is part of early literacy. We have puppet theaters and writing tables, block bins and early literacy computer stations, so why not include iPads into the design for our children’s areas? A number of the programs that we use extensively in our early literacy programming, such as Every Child Ready to Read and Mother Goose on the Loose, are incorporating new media into their programs. The National Association for the Education of Young Children and the Fred Rogers Center for Early Learning and Children’s Media put out a joint position statement in January of 2012 with recommendations for using technology with young children. One of the key messages of that position statement was the need for “information and resources to effectively select, use, integrate, and evaluate technology and interactive media tools in intentional and developmentally appropriate ways.” Children today are increasingly more familiar with technology, whether libraries are a part of it or not. And we need to be part of it. Because providing information and resources to select content for children is central to what we do as children’s librarians. Parents, teachers, and even app developers are looking for guidance. There are so many “educational” apps out there for children, it can be completely overwhelming. Immediately after we installed the first iPads at South Natomas, we had parents asking for information on the app being featured. There are parents who care about what content they’re giving their children, and they’re looking for recommendations. Librarians are already giving quality advice about which board books or picture books are appropriate for their young children, and we can be just as comfortable giving a great app recommendation. Parents will put their smartphones and tablets into the hands of their young children. Having iPads in the library gives us credibility to recommend good content and best practices for the use of that technology. Having early literacy iPads in our library supports our goals of promoting literacy. The iPads, like the AWE early literacy stations, are engaging. They attract families to the language-rich early literacy spaces that we’re creating and encourage children to engage with each other, with the technology, and with their caregivers. By loading high quality, developmentally appropriate apps we encourage children to engage in talking, reading, writing, singing, and playing – the behaviors that will help them build a strong foundation for learning to read later in life. When they touch a balloon in “Make It Pop,” it increases their awareness of the alphabet. When they trace a letter in “LetterSchool” it prepares them to be able to write their own name. By installing early literacy iPads with librarian-selected content in the library, we’re also providing access to all of our families, not just those who can afford to have an iPad at home. With the increased likelihood that children will encounter tablet technology in educational settings, there is a need to address the “digital divide” between children from higher-income and lower-income families. Whether you’re looking to update your existing children’s area, or designing a new language-rich kids’ learning space, consider incorporating interactive technology to encourage early literacy and digital literacy for all your families. Amanda Foulk is a Youth Services Librarian at Sacramento Public Library. She became passionate about children and technology when her branch was chosen to pilot early literacy iPads for the Sacramento Public Library system, and has always been opinionated about quality content for children in any format. She can be reached with questions or comments at afoulk@saclibrary.org. Posted on January 10, 2014, in Interactivity, Libraries and tagged Amanda Foulk. Bookmark the permalink. Leave a comment.